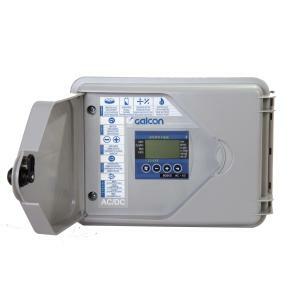 The 8000 Series AC Controllers from Galcon are easy to install and operate. These controllers are well suited for greenhouse and misting applications where you need irrigation duration of 1 second up to 12 hours. This is a very user-friendly unit with 4 programming buttons and an easy to read LCD screen. Has a rain delay feature for up to 30 days with automatic restart. Automatic, semi-automatic and manual mode for each valve or all of the valves simultaneously while automatic short circuit detection isolates any shorted valve and provides a visible “alarm” on the LCD screen and continues irrigation for the rest of the valves. This is the outdoor model enclosed in a durable weatherproof case.